Tyler Kleist started his aviation career in late August of 2011 when he began training in the Airline Career Pilot Program with ATP. He completed training and began instructing at ATP in January of 2012 at our Flight Training Center in the Atlanta area at KLZU. I found the transition to be very linear. From day one of training ATP emphasizes checklists, flows and callouts. When you get to training in the next step in your career, you find the best thing you can do prior to arriving for training and during the training event are to have the checklists, flows and callouts down pat. Although the training at Ameriflight seems to be really quick and intense, I was at least prepared mentally for the pace from my previous experiences at ATP. 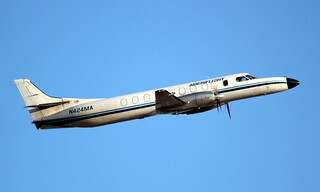 Ameriflight has Piper Chieftain/Navajos, Beech 99s, Beech 1900s, SA-227 Metroliners, and Emb-120s. I’m a Captain on the Beech 99. First year captain pay is about 2300/month before taxes, but you can earn more by taking special flight assignments. A typical day starts at 5-5:30 AM. While the pilot and co-pilot are pre-flighting, checking weather and NOTAMs, and filling out the required paperwork for every flight, loaders fill up our planes with the cargo we will be carrying to our destinations. Once that is all done, we fly and drop off the cargo. Most flights finish for the morning at an outstation base, where a hotel is provided for the crew. The mid-day is your time to do what you would like (eat, sleep, workout, etc.). By early to mid-afternoon it is time to return to the plane, where the return cargo is loaded onto the airplane, and we fly back to Salt Lake International. My day usually finishes between 7:30-8 PM. Weather is a factor we are always contending with, as we don’t fly high enough to get above it. Every Ameriflight pilot has their fair share experience shooting approaches, at night, in IMC, while collecting ice, only to get to their decision height or missed approach point to go missed and divert to their alternate. All with a round dial HSI/CDI and no autopilot. It sounds scary, but once you do it and do it well, it gives you a great amount of confidence in your skillset as a professional pilot. You can take that confidence and sharpened skillset to progress your career further down the road. The upgrade times to a bigger plane is measured in weeks and months, not years. Other than quick upgrades, there are opportunities to become a training captain for the company. About half of the Training Captains on the aircraft I fly here are ATP graduates. Additionally, most flight management positions (the base assistant chief pilots, airplane specific program managers, etc.) are filled internally by qualified line captains.